As the final week this is a summary of the project and includes the process for choosing the product name: Broove. 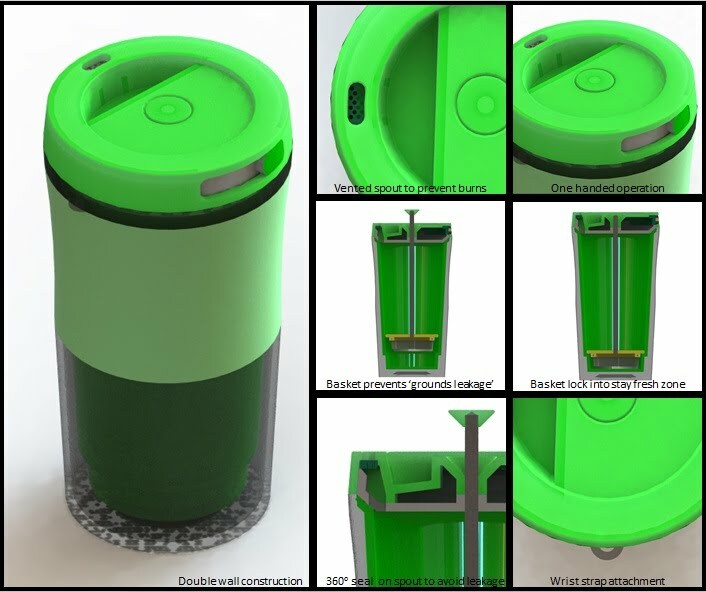 The problem seemed simple- a better way to take fresh hot or cold drinks on the go. This problem definition did not change much throughout the design process, but through the investigation phase of the concept designs the idea of brewing the drink on the go was one I really like d and continued to work with as a latent need solution to getting the drink fresh. The Key user needs are listed below, along with the key features of the product which ultimately meet these needs. These are the key features of the product. These are targeted to meet both the key user needs and address some latent user needs for additional 'wow' factor. Vented spout opening prevents 'gulping' and therefore reduces opportunity for the user burning their mouth. Internal screw thread on the lid creates barrier to leakage from the lid-body seam. Double walled vacuum chamber in the base and lid increase the thermal properties of the product to keep the drink hot/cold. Integrated coffee brewing system helps brew on the go so the coffee is at its freshest. Stay fresh base traps the basket to maintain the drink at the strength the user chose. No leak features means carrying in a purse or bag is now possible! Single hand operation- use the thumb slide, left or right, to open the spout. Smooth shape for holding with integrated grip area. Attach the lid with the plunger up. *Wait 3-5 minutes for drink to brew. See strength of brew through clear mug walls. Push plunger down to 'lock' drink at your ideal brew strength for best taste. Use thumb slide to open the spout with a single hand. To name the product I used the themes of Brewing, Travel, Freshness and Drinks to generate a list of words which could be combined in different ways. From this I found that the incorporation of the drinks names had the feeling of limiting the capabilities of the product so I eliminated these from my considerations. I used the =Text() function in excel to help generate combinations quickly which gave me over 300 possible combinations using simple words. I could then look at these combinations to see if any compound words were feasible or could be adjusted to make a cool made up name. The reasons for this were that it concisely explains what the product does- brews a drink on the move- and it gives a youthful vibe to appeal to the young professional target market. Other comments included that this name indicates the products ability to help you find your 'groove' first thing in the morning (as part of your daily routine). 1. To make further manufacturability refinements to improve the quality of the final product and simplify the plastic moulds in order to reduce cost. 2. To create a physical model of the unit. Stereolithography or milling would be the preferred processes as they are fast and highly accurate. Milling is likely a lower cost though it will take longer to produce. 3. To make further refinements as necessary and begin negotiations with manufacturers.